New Delhi July 12 (IANS) The Aam Aadmi Party on Thursday said it has received 1.53 lakh signed letters in 12 days for its demand for full statehood to Delhi. It said the party will take the fight to the booth-level to strengthen the campaign. 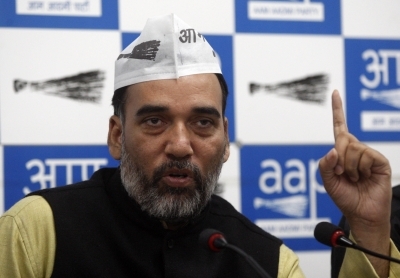 "The party will hold a meeting with all its MLAs on Sunday to discuss further plans to speed up the signature campaign " AAP s Delhi state convener Gopal Rai said. "We have received around 1 52 000 signed letters from 272 wards and 70 Assembly constituencies. We will take this fight to the booth-level " Rai said. On July 1 the party had launched a signature campaign Dilli Maange Apna Haq (Delhi demands its right) for getting full statehood to Delhi aiming to reach out to 10 lakh families and take their signatures for the cause. On the confusion over the Supreme Court s July 4 order he said the court did not say whether or not Delhi should get full statehood. "Instead the court said the Centre and the Lieutenant Governor together are trying to sieze whatever little powers the Delhi government has. The court gave Delhi government the power to make laws on all subjects except three (police land and public order) " Rai said. "The Delhi government can make schemes but to implement these the support of the bureaucracy is important. But the officers are not listening to the government. From doorstep delivery of ration to installation of CCTV cameras all our schemes are being interrupted " Rai said.